Dental implants are a state-of-the-art option for tooth replacement that has become the “gold standard” for restorative treatment. Dr. Deborah Romack and Dr. Garrett Mulkey use their training and available technologies to create beautiful smiles that function comfortably and properly. At Cosmetic & Family Dentistry of Weatherford, we perform both the surgical placement and restoration of dental implants, making the procedure convenient for our patients and allowing you to remain with the dental healthcare providers you trust. When you choose dental implants to replace your missing teeth, you’re choosing an option that allows you to feel comfortable, function properly, and look great at the same time. Dental implants help you maintain your natural facial shape and a smile that looks real. Dental implants are a lot like natural teeth, which gives them a lot of advantages over options like fixed bridges or dentures. The benefits of dental implants include the ability to eat whatever you want, a younger appearance, better jaw health, confidence, a natural appearance, and long-lasting results. Dental implants can secure single crowns, bridges, and dentures, giving you options that fit your specific pattern of tooth loss. They don’t require us to modify remaining healthy teeth, which is a big plus. Also, patients who opt for implant-supported dentures experience better security, better chewing function, and better overall digestion. If you’re missing teeth, contact Cosmetic & Family Dentistry of Weatherford to explore dental implants as a treatment option. Because we offer a range of services for Weatherford, Aledo, Brock, Millsap, Mineral Wells, Springtown, and beyond, we can help you navigate your choices and make one that meets your needs. After you have chosen to get dental implants, the first part of the procedure is to have them surgically placed into your jaw. For this, your doctor will make a small incision in your gums and place the small titanium posts that will serve as your new tooth roots. Often, this surgery only requires local anesthesia, and any discomfort afterward can be easily managed with medication. Once your implants have been placed, you’ll be given 4-6 months to heal and allow the roots to naturally bond to the surrounding jawbone. One of the most common ways we restore implants is with crowns and bridges. Much like traditional crowns and bridges, these can be used to replace a single tooth or a row of missing teeth. An implant retained crown is made of 100% dental porcelain, giving it both the strength and appearance of a natural tooth. This crown will be connected to the actual implant using a metal connector called an abutment, which will look like a tiny screw. 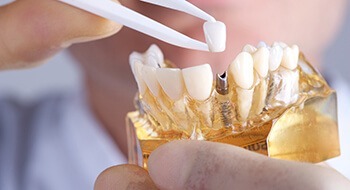 In the case of a bridge, you’ll have a crown placed on your implant, and this crown will be used to support a prosthetic tooth that fills in the gap in your smile. The end result is a new, complete smile that looks natural and will last for many years. In fact, just by brushing, flossing, and getting regular check-ups, your implant retained crowns and bridges can easily last for decades. Dental implants are actually quite versatile. They can be attached to a variety of dental prosthetics to replace missing teeth throughout your mouth or even an entire set of teeth. These usually involve a denture being attached to a set of implants. While they may look like normal dentures, they have a variety of advantages over traditional ones. 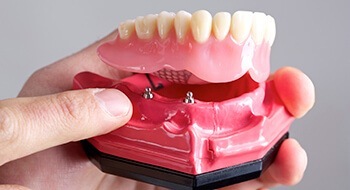 Since they are being held in place with dental implants as opposed to just natural suction or denture adhesive, they are much more stable and you won’t have to worry about them slipping or clicking. The implants support your jaw from the inside, and this prevents the bone recession that often makes a new set of dentures lose their fit after just a few years. 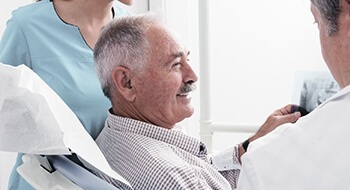 They also enable a patient to eat a wider variety of foods more comfortably because they allow for a much stronger bite force than traditional dentures. In order to get dental implants, a person needs to have an adequate amount of healthy jawbone to support the new titanium roots. 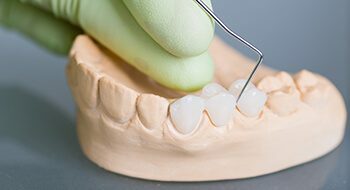 For people who have suffered extensive tooth loss, their jaw may be thin and brittle, which would normally disqualify them from getting dental implants. However, they can now get mini dental implants. As the name suggests, they are only a fraction of the size of regular implants, and allow even more people to get the most reliable tooth replacement option available today. This method allows people who don’t have enough healthy jawbone to support traditional implants to get an implant retained denture. It involves strategically placing four implants to provide maximum support. Two posts are located at the front of the jaw where the bone is naturally thicker, and two posts are placed at the back of the jaw at an angle. With just these four posts, a patient can enjoy an entire arch of new teeth.